Google maps gives the right location. GPS navigation sytems do not bring you to right location when you use the address information above. From Schiphol Airport by train or pick-up arranged with SURfaPLUS. Train takes about 70 min. By train, travel via Amsterdam-Duivendrecht (change train) and take the train with direction Arnhem/Nijmegen. Leave the train at station Ede-Wageningen. From here you can take a taxi (approx. 15 euro) to the Binnenhaven 1 in Wageningen ('kantoorkasteel') or a pick-up is arranged with SURfaPLUS. If not travelling from Schiphol Airport (see above), travel to station Ede-Wageningen or station Arnhem. From both stations you can take a taxi (approx. 15 euro from Ede-Wageningen and 40 euro from Arnhem) to the Binnenhaven 1 in Wageningen ('kantoorkasteel'). Driving on the highway A12 (E50) take exit Ede-Wageningen (no. 24) and head towards Wageningen (to the South). Near Wageningen, go straight ahead at the roundabout. Entering Wageningen, turn right at the crossing with traffic lights and keep following the ring road towards Rhenen. After a few traffic lights and one sharp turn to the left (continue following direction Rhenen) go straight ahead on two consecutive roundabouts. After the second roundabout immediately turn right to enter the parallel road. At the end of this road, after 50 m., you will find the office building of Binnenhaven 1 ('kantoorkasteel'). Driving on the highway E19 to the north, head towards Utrecht. When approaching Breda, take the A27 to the north and leave this highway at exit 27 (close to Gorinchem) and take the A15 to the east (direction Arnhem/Nijmegen). Leave the A15 at exit 35 (Ochten/Kesteren) and follow direction Rhenen to the north. Having crossed the river Rhine, follow direction Wageningen (N 225, westwards). Near Wageningen, go straight ahead at the roundabout. Having passed the sign 'Wageningen' turn left at the next roundabout. This road slightly bends to the right. Turn right at the next roundabout and immediately after this turn right again to enter the parallel road. At the end of this road, after 50m. you will find the office building of Binnenhaven 1 ('kantoorkasteel'). 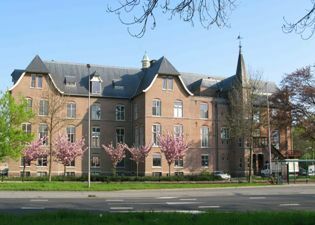 SURfaPLUS B.V. keeps office on the third floor of the historical Kantoorkasteel, the characteristic location of the formerly Government Seed Testing Station.